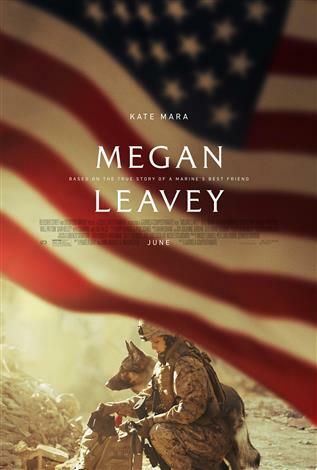 MEGAN LEAVEY is based on the true life story of a young marine corporal (Kate Mara) whose unique discipline and bond with her military combat dog saved many lives during their deployment in Iraq. When she is assigned to clean up the K9 unit after a disciplinary hearing, Leavey identifies with a particularly aggressive dog, Rex, and is given the chance to train him. Over the course of their service, Megan and Rex completed more than 100 missions until an IED explosion injures them, putting their fate in jeopardy. Directed by Gabriela Cowperthwaite (BLACKFISH) from a screenplay by Pamela Gray and Annie Mumolo & Tim Lovestedt, the film also stars Edie Falco, RamAn RodrAguez, Bradley Whitford, and Common.